Look up the archives of Coupfourpointfive Monday, June the 29th, 2009, and you'll find the story headlined: “Bainimarama fed up of Ganilau” and this qoute, “The interim Minister for Defence Ratu Epeli Ganilau is likely to be terminated as an interim minister from the regime's Cabinet, our sources say. "Sources say interim Prime Minister Frank Bainimarama is unhappy about decisions Ganilau has made as interim minister. "Sources say Bainimarama is not happy with Ganilau's approval to allow a businessman under investigation for taxation matters to fly out of the country last weekend. "Coupfourpointfive has been told that the businessman was being investigated by Fiji Independent Commission Against Corruption, who had initiated a stop departure order against the businessman. "But Ganilau pulled some strings and allowed the businessman to fly to New Zealand. "Bainimarama was reportedly angry at Ganilau's actions but the interim minister told him the businessman would return to Fiji in 8 days time. "We have been informed Bainimarama told Ganilau if the businessman does not return then Ganilau's head will roll,” unqote. It took more than seventeen months for the situation to arise that proved my point, although Ganilau it seems took destiny in his own hands by resigning. Because of the draconian media laws, trying to decipher the shrouded decisions and manipulative actions of the military regime has become an easier game for bloggers than media with an ever growing resentful and restless population. One of the few times the nation wasn't left guessing was last night when Adrian Sofitel announced at the TFL Prime Minister's Exporters of the Year Awards that Ravuni Uluilakeba had replaced Annie Rogers as CEO. Rogers has obviously been sacked as head of the Trade and Investment Bureau and the announcement - in his speech - took many by surprise. What Bainimarama and his regime spin doctors must understand is that Fiji, and indeed Suva, is ever so tiny a community and trying to hide the truth from the world is ever so futile. When Queen Elizabeth Barracks was built in the 1950s, Nabua, it was four miles was 'off the map' in the reckoning of the city planners . Today, it is the centre of the most populated Suva-Nausori corridor in Fiji. 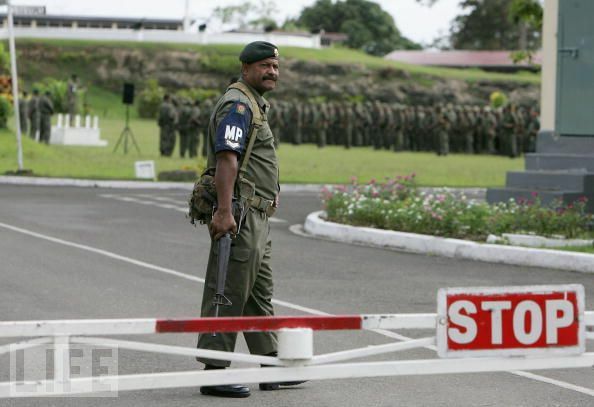 Ninety five percent of soldiers that are based at Queen Elizabeth Barracks and surrounding military bases in Suva, live among the wider community in this corridor unlike military bases overseas. Interaction with civilian society is daily. Every small alcohol-fuelled incident at the Officers Mess, or cover-up or act of nepotism ... or whatever in the military, let alone the in-fighting within the regime, is dissected at the Suva market yagona circles the next day. More still, international bloggers know about it almost instantly. Again, as indicated the Coupfourpointfive news item seventeen months ago proves that the political crisis has been fermenting for some time and just prolongs the agony of the people. Now that the regime has registered all mobile phones, maybe it should now consider isolating all soldiers and their families by shifting camp to Colo Wainimala or even better, Rotuma, given all the military ‘development’ projects going on there. The silly buggers certainly forgot about modern technology, mobile phones, the internet, satellite television, youtube, and more recently twitter and 3g mobile phones and all their applications etc. not to mention streaming and so on, sorry, I said not to mention it, then I did, silly bugger I am too ! & lawyer - but what's with the euro $TM symbol in his posts? PER Extended again and surely we can expect a furious response from crosbiewalsh and his coup apologists defending this outrageous attack on basic media freedoms and assembly. We can expect comments long the lines that the current system with PER is just 'working so well, why not keep it' . This is usually said by others from the comfort of their nonfijian domiciles but always quick to trade away Fijian rights. Sa loloma baka levu i Viti. Thats waht you think Jone. He is only getting stronger by the looks of things. Ratu Epeli going is just like you....no regrets and you have become meaningless in the whole equation where you thought you were something. Crosbie Walsh is a serial wanker, why bother wasting space mentioning him on this blig. How corrupt is Aiyaz & the IR. The more coup.....the tonnes of corruption really. There has been confirmation that the PM has collapsed again in China and that why he is not back today. Inner circles are saying that he has a had a bad stoke. He is receiving intensive treatment in china. Anon@ 7.07pm Think you got the wrong writer?? And 2.38pm Vore nor Khaiyum are losing their power base and you know it. Their use-by date is well over and they know it. As for the ANU writer, he is a man ahead of his time and serving the people of Fiji well from exile. While most freedom bloggers may find Crosbie Walsh’s writings slanted in favour of this regime it would be fair to point out he is far from defending this poxy PER. Now we may approximate what Crosbie thinks but the fact is if we are truthful Crosbie has written in-depth voicing dissension at the constant extension of the PER. Bainimarama offers his opponents the greatest deal on earth and that is to join in the solidarity of his fellowman and work towards a peaceful and honest Fiji. @Jake Enuff ... think we should put our creative best on more worthy issues and there are many of them! @anon Nov 22 2010 2:38am....at least the colonel is man enough to put up his photo and name and say it like it is.....compared to you who is hiding behind a ficticious name and no face.......A COWARD AND USELESS SOB....MAN UP AND SHOW YOURSELF IF YOU WANT TO BE TAKEN SERIOUSLY IDIOT. Consider Anon could be in Viti - whereas colonel is not? @ anon 6:14 pm so what Iam in Fiji. Its not like the colonel is in Australia doing nothing. If frank what to see me than good, he knows me, am not scared of frank, he is just another human being like me period.